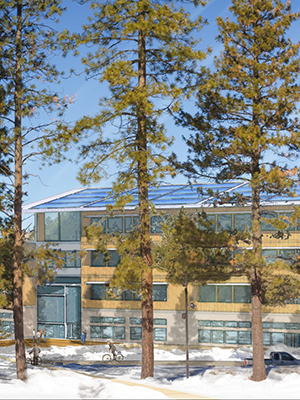 Conceptual image of OSU-Cascades' next academic building. Oregon Gov. Kate Brown will sign the legislative bill authorizing funding for the next academic building on the Oregon State University – Cascades campus in a ceremony to be held at 1:45 p.m. on April 18. The signing will be hosted by OSU-Cascades Vice President Becky Johnson in the Bruckner Courtyard, immediately west of Tykeson Hall* on the OSU-Cascades campus on Chandler Avenue. The event is anticipated to attract members of the Central Oregon legislative delegation, donors whose gifts of over $9 million for the academic building are helping achieve a $10 million philanthropic match for the state funding, and members of the Now4 OSU-Cascades advocacy group and the Beaver Caucus coalition. Brown will sign House Bill 5702, which includes $39 million in capital funding for the new building. The building will be devoted to the study of STEAM subjects – science, technology, engineering, art and mathematics. OSU-Cascades has committed to use Oregon manufactured wood products - particularly cross-laminated timber - in the construction of the building. *Due to weather, the event will take place in Tykeson Hall, Rm. 111.